This brief overview of COPD will bring you up-to-speed on the latest information and management of this rapidly-growing chronic disease. 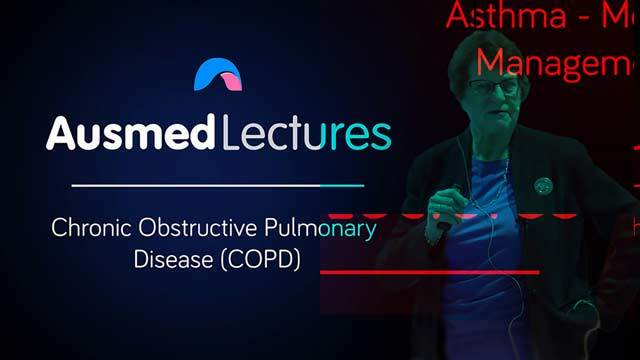 This talk from Dr Jenny Gowan follows on well from the talk entitled 'Asthma - Medicines and Management Update' and is recommended viewing if you are interested in respiratory education. Jenny Gowan, a practising pharmacist, is a teaching associate at Monash University, Melbourne and a clinical associate of RMIT University. She is a member of the PSA Branch committee, the Expert Group for Therapeutic Guidelines – Respiratory version 5, an editorial board member of AUS-DI, SHPA "Don’t Rush to Crush", the Guidelines Committee for the Australian Asthma Handbook (AAH) and the writing group for the RACGP ‘Medical Care of older persons in RACF’ (Silver book). Jenny is an accredited consultant pharmacist who conducts her own company, which focuses on medication reviews in the home and aged care facilities, plus education, writing, training, and consultation. Jenny works regularly in community pharmacy plus sessions in a GP clinic at a Community Health Centre. She has published over 400 educational articles. Jenny has presented talks at many Australian and international conferences to GPs, nurse practitioners, nurses, podiatrists, pharmacists, and other health professionals. In 2013, she was awarded the Australian Pharmacist of the Year by the Pharmaceutical Society of Australia and, in 2016, the AACP-MIMs Australian Consultant Pharmacist of the Year.